BRACELET - SARAH COVENTRY. "COFFEE AND CREAM" FROM 1973. 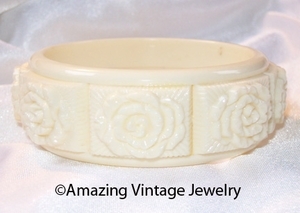 MOLDED PLASTIC BANGLE IN CREAM ONLY...VERY ATTRACTIVE! 1 1/8" WIDE. FITS MOST WRISTS. VERY GOOD CONDITION.